Home > Divisions > Late Models > Jason Feger takes Monster Midwest Series win at Tri-City Speedway! 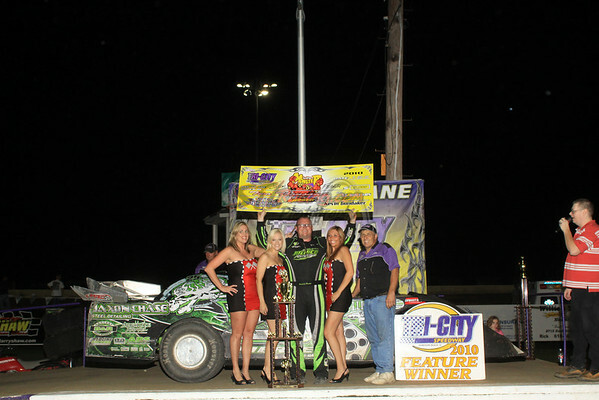 Jason Feger takes Monster Midwest Series win at Tri-City Speedway! Pontoon Beach, IL (September 23rd, 2010) Jason Feger only led one lap of the thirty lap Monster Midwest Late Model Series main event at Tri-City Speedway, but it was the most important lap! Feger took advantage of a two lap shootout at the end to rocket past Ryan Unzicker to earn the win. Feger appeared to be a fourth or fifth place car in the closing laps, but when second place running Brian Shirley broke with two laps remaining and collected third place running Dennis Erb, Jr., that was all Feger needed as he restarted in the second spot and used the high side to move past Unzicker on the final lap. Rusty Schlenk led the early laps and appeared to be on his way to a dominating win, but after the event was slowed by a couple of cautions, Unzicker found a faster line on the very bottom and moved past Schlenk for the lead. Schlenk then found himself racing with Frank Heckenast, Jr., Erb and Feger for the second spot. Schlenk and Heckenast would make contact down the backstretch which would damage the right front suspension on Schlenk’s car and end his night. Heckenast would suffer problems later as he found the outside wall on several occasions while running up on the cushion. He would finally break as well and fall from competition. Unzicker would lead all the way to the final lap, sometimes even enjoying as much as a ten car length lead. But he would have to settle for second at the end. Bobby Pierce would finish in the third spot with Rick Salter taking fourth. Michael Kloos completed the top five.